Permission Granted: Take a step back, and allow yourself the opportunity to recharge and renew. Take the time-out you need, press ‘reset’, and return with greater ease and joy. Join NYC based yoga teacher Rita Murjani on this magical and re-energizing retreat to eco-chic paradise! 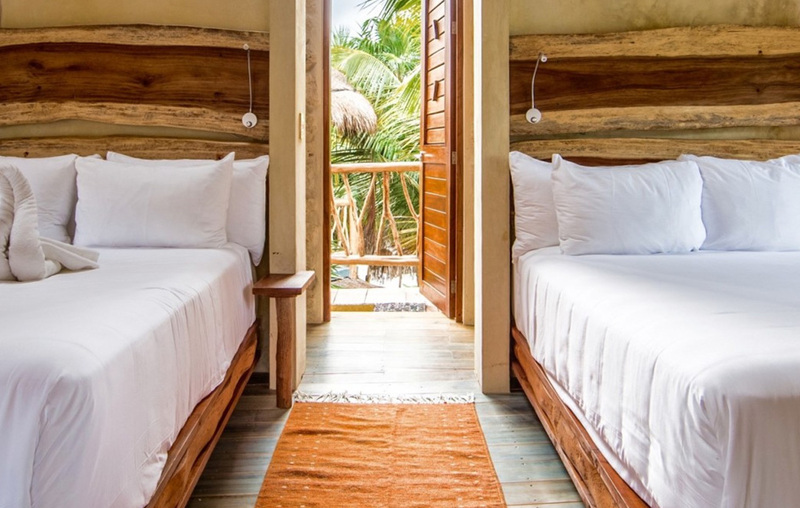 Located on the Caribbean coast of Mexico in Quintana Roo, Tulum is the perfect combination of sun, salt, and sea. Expect morning meditation and asana practice (for all levels), then make the tough choice of taking an afternoon swim or snoozing in a hammock. We'll share delicious meals, surprising conversations, and lots of laughter! Nestled between clear blue waters and the Mayan jungle, travelers have been called from around the world to the shores of the Riviera Maya. The undercurrent of Mayan tradition runs as deep as the nearby cenotes and can be experienced through Temazcal, Mayan Clay Ceremony, and ocean-to-table tacos. Opportunity abounds whether you choose to explore, adventure, or recharge! Getting around is easy - either by foot along the beach or by bike or local taxi into town. Boutiques and restaurants line the main road in Tulum town, or venture beyond to wander the Mayan ruins at Chichen Itza. Alaya is on the south side of the shoreline where things seem to be a bit sleepier and even the ocean waves more gentle. With just 20 villas and palm-tree-lined pathways, the property is intimate and serene. The staff is kind, attentive, and have a certain way of making Alaya feel like home. All rooms have en-suite bathrooms and plush pillows, while many offer gorgeous views of the ocean and terraces for lounging. Alaya’s vision is to preserve a high regard for Mother Nature -- walking barefoot highly recommended! All meals are prepared with love using only fresh local, organic ingredients, to provide a nourishing experience inside and out. Think Mexico meets the Mediterranean with fresh squeezed juices, seasonal healthy snacks, and freshly caught ceviche (don’t worry, you’ll still have room for dessert). The staff is thoughtful and will happily accommodate any dietary restrictions. Tulum is a less than two hour coastal drive from Cancun Airport, where many flights are offered daily (4-hours non-stop from NYC). You can choose to rent a car and make the drive on your own or we can organize transit to and from the airport. Depending on arrival times, we will do our best to group people together! Of course, you can also hire a local taxi on your own. In addition to the yoga / meditation / pranayama classes offered on this retreat, healing body work, sound baths, and beach loungers are all just beyond your doorstep. If you’re feeling more active, a variety of water sports (scuba, snorkel, kitesurfing, paddle boarding, etc) are available as well as guest access to the Tulum Jungle Gym. You can explore the nearby cenotes, adventure to the Mayan ruins, or wander the boho-chic boutiques in town. Of course, you can always fall asleep reading a book to the sound of crashing waves (highly encouraged). Extras like massages, private excursions, margaritas, meals out, staff gratuities, car rental, airport transfer, and domestic / international airfare. *USD $400 non-refundable deposit is required to hold your spot. Payment due in full one month prior to the retreat. Email hello@rmurjani.com for questions or additional information.